This is my second card for Our Daily Bread Designs' one layer card challenge. My inspiration came from a card I found on Pinterest made by Kristina Werner. Unfortunately, the pin didn't lead to that exact post on her blog, and so I can't link to it here. I didn't use a sketch for this card. I started by cutting a piece of magenta cardstock to 4.25x5.5". I stamped ODBD's "Dahlia" stamp three times in Versamark ink, to get a subtle, tone-on-tone look. I made sure not to line the images up exactly, and leave room for my greeting. For my greeting, I used one of the stamps from the "Word Labels" set by Sizzix. I stamped it in Versamark, then heat-embossed it with Recollections "Snow" embossing powder. And that was it. Very clean and simple, and definitely not my usual style. But I like it, and hopefully it will inspire one of our overseas military heroes to write a note home to his sweetie! Another classy CAS card Andrea! The dahlias look beautiful on the pink card! Someone's day is going to be brighten from both giving and receiving this beauty! Thanks for joining us again at ODBD! 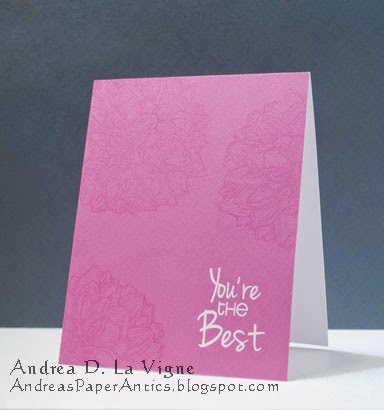 Oh, Andrea, another beautiful one-layer card for the ODBD Shining the Light challenge! This is beautiful with the wonderful shade of pink! I love the Dahlia stamped with Versamark for a subtle touch, and the sentiment is wonderful in white! Really pops! So nice to see more than one card for this challenge, sweet friend! It was fun! Hugs!